Van den Hul MCS 150M Cable. Set of 4 (0.5m) For tonearm rewire. Tonearm Cables and Connectors. Tonearm Essentials. Twisting 4 lengths of The MCS - 150 M together (with clockwise conductor wiring - - = starquad) will produce one of the finest interconnects you can think of. KM0335 manufactured by Krüger&Matz. fertig konfektioniert mit Bananensteckern (für 4mm Buchse). HighEnd Lautsprecherkabel. Kabel 2 x 2,5mm² Querschnitt, OFC-Kupfer. of HighEnd Speakercable. Just for chuckles, cut into your present network cable - and be horrified at what you see! Made from heavy-gauge screened OFC cable, terminated at both ends with Preh twist-locking metal bodied 4 pin DIN plugs, as per original SNAIC 4 Naim design - but at a fraction of the cost. Our cable carries the 24V DC required to power pre-amps. 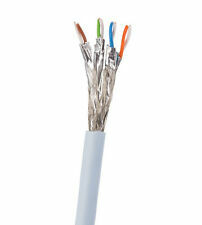 We can produce this cable in various lengths, please contact us if you require a custom-length. . Connections: 2 x RCA (male) - 2 x RCA (Male) GOLD. 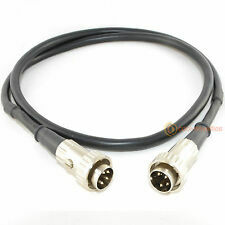 2 RCA to 2 RCA twin Cable. Connects Stereo's, Hi-Fi's and other audio devices together. 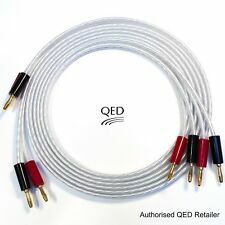 Award Winning Cables from QED. QED PERFORMANCE. QED Performance cables do exactly what interconnects should, that is, maintain signal integrity and reject noise. Phono RCA Cable. This phono audio cable will connect your CD player, DAC or tuner to your amplifier or receiver. The 24K gold-plated Airlock plugs are fitted to the ends of the speaker cable by a skilled technician using a high pressure hydraulic ram, which `cold welds` the plug to the cable, eliminating all air from the join. (PID between R001-R200 and R636-R999). Look at the bottom of your speakers or subwoofer for a small white sticker with a 3 digit number following an 'R' on it. It also has self - adapt ive 5.1/2.1 mode switch as shown in the following picture. 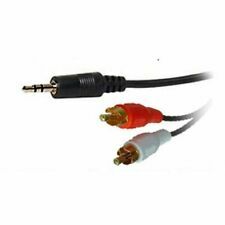 CÂBLE JACK 3.5mm MÂLE / 2 RCA MÂLE STÉRÉO 1.5 mètres. This ensures that the signal is kept clean with low noise interference and is maintained down a low resistance path (ideal for longer lengths). The outer jacket is made of a tough but flexible PVC. Conductor Material - Bare ultra pure oxygen free copper wire Stranding7 x 0.20mm. more » the fiber tip. High-performance TOSLink Digital Optical cable for the perfect signal transfer. 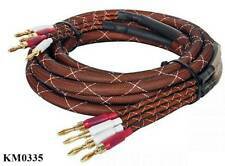 3.5mm Stereo Audio Cables are specifically designed for quality audio applications. This cable will also connect your ipod / mp3 player to your car stereo via an AUX input. 1 x 1.5m 3.5mm Jack to Jack Aux Cable. QUESTI IN ASTA SONO COPPIA DA 3mt DISPONIBILI ANCHE DA 2mt-4mt E 5mt ,CHIEDETE. CON LINEA NERA A DISTINGUERE IL POLO POSITIVO. mi scuso ma quando avevo visto i cavi non avevo capito, perchè sulle tue foto su internet mi sembravano diversi. NEO OYAIDE D RCA CLASS B 1MT. 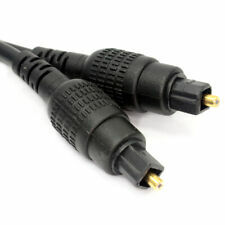 TONEARM CABLE - 1m - Straight Mini Din To RCA. The triple RCA coupler has female connectors for connecting male RCA/phono cables. Triple RCA Coupler - GOLD. Triple RCA Coupler. 3x RCA Female - 3x RCA Female. 3-WAY CD/AUX STEREO SWITCHER. This compact switcher box allows connection of up to three stereo sound sources, to one amplifier. Channel Separation : 60dB @ 1kHz. - CONNECTS VIA NICKEL PLATED RCA SOCKETS. Usually used to connect hi-fi separates together or DVD player to hi-fi. The red and black/white phono connectors on any audio hardware give left and right channel audio, and can connect to anything with matching connectors. SKU : 007404. Create your own Panel mount connection with 3.5mm Panel mount cable. Idela for custom AV installations. Connector Type B: 3.5mm Stereo Jack Socket, Panel Mount. 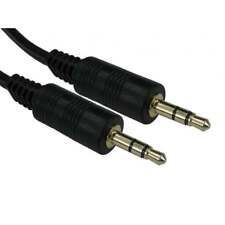 3.5mm stereo jack plug to socket adapter lead. 2.5mm Jack (headphone jack) to 3.5mm jack cable. For interconnecting 2.5mm outputs or inputs to a 3.5mm input or output. e.g. micro mp4 player to car aux input. Headphone Amplifiers. Speaker Stands and Supports. With the design of The Clearwater, it was our intention to produce the best match between quality and price. Cable Burn-In Service. Cardas Custom Adaptors & Cable. Mono 3.5mm jack to jack cable in 1.2m length. 3.5mm MONO connections. Pure Copper conductors. The stereo cable splitter is constructed of a 3.5mm stereo jack and two 3.5mm female sockets, all are Gold flashed for higher quality finish and anti-corrosive properties. 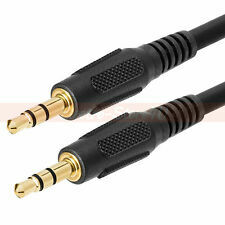 0.2m 3.5mm Stereo Splitter Cable. Adaptateur Jack 3.5mm a 2.5mm-. Idéal pour convertir un jack standard vers du format mini 2.5mm. Possibilité d'envoi suivie lettre suivie. If you have a high quality system like Bang & Olufsen, Quad ,Naim etc. Do NOT buy low grade cables as you will only get a low grade sound from them. Bang & Olufsen. then this lead can also be used. Connections: 6.35mm Jack plug to 3.5mm Jack plug. 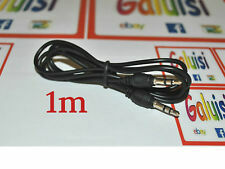 1.8m 6.35mm to 3.5mm Stereo Jack Cable. A high quality 6.35mm to 3.5mm Stereo Jack cable. AudioQuest / AudioTruth Opal Audio Interconnect Cables 1M Pair- Very Good Cond! AudioQuest Topaz Audio Interconnect Cables 1M Pair- Excellent! AudioQuest Bulk Speaker Cable 15FT Pair- GOOD Condition!